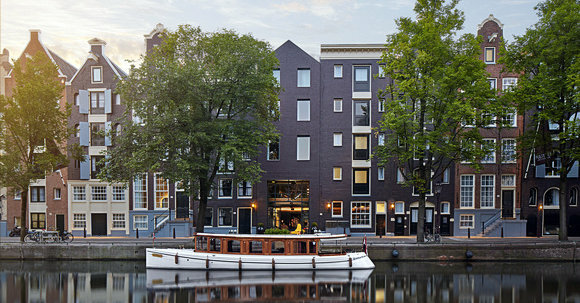 This 225-room hotel is comprised of 25 connecting canal houses built by wealthy merchants and aristocrats 400 years ago during the Dutch Golden Age. The five-star hotel was originally owned by Peter Pulitzer, whose grandfather Joseph established the Pulitzer Prizes. It had a head-to-toe refurbishment in 2016 and is now a social hot spot. The public spaces — the bar, the courtyard garden, the restaurant — are full of good-looking locals and tourists. The hotel owners care deeply about its past, and there are reminders of it everywhere. The venues are named after historical characters, and signs in guest rooms tell you who lived there throughout the centuries. The Pulitzer Amsterdam is nestled between two of the city’s peaceful canals. My room overlooked a waterway and had a private balcony for watching the riverboats and bikers. Big tourist attractions like the Anne Frank House and the Rijksmuseum are a few minutes away, and colorful signs by the elevator suggest nearby sites to visit. The hotel is in the Nine Streets, a neighborhood full of quirky shops, bars and cafes. You can buy anything from old violins to vintage clothes to bow ties just outside the hotel. In the Pulitzer Amsterdam, no two rooms are the same. I stayed in an airy, modern room with floor-to-ceiling windows, pastel-colored furniture, and a chandelier. The room had so many amenities, I kept discovering more in drawers and closets throughout my stay. There was local coffee and tea, a sewing and shoe shining kit, branded stationery, even complimentary stroopwafels (the popular Danish cookie). There wasn’t the one thing I really wanted: a full-length mirror. And I never received turndown service, which I expected at a five-star hotel. The bathroom was spacious and new (the countertops looked as if they had never been used). There was a deep bath tub and a rain shower with great pressure. The shampoo, conditioner and shower gel was made for the Pulitzer Amsterdam by upscale New York City perfumery Le Labo. I liked the products but would have liked them to be local. The hotel has a two-story gym with up-to-date equipment, a library, an outdoor garden with four swings, even an in-house flower shop. The best amenity by far is the concierge team, which has extensive local knowledge. After check-in a concierge will walk you to your room and give you an overview of the hotel and recommendations about what you should do during your time in Amsterdam. I emailed the team when I was walking around the city with a question, and they responded within minutes. The hotel has exclusive walking and canal boat tours for its guests. The latter takes place on a classic salon boat from 1909 — the captain said that Winston Churchill rode on it in 1946 — and it has polished teak and brass, marble, leather, even carpeting. It’s worth staying in the hotel just for this. The captain handed me a glass of wine and took me and the other guests on a lively and informative water tour of the city. He knew everything from where John Adams lived when he was an ambassador to the Netherlands to where Justin Bieber likes to party when he’s in town. It felt like a steal for 38 euros a person. Jansz is an airy, elegant restaurant. The menu is eclectic and combines specialties from countries across Europe. For an extra charge (29.50 euros per person), hotel guests can have breakfast here. You get to choose a hot dish off the menu as well as help yourself to a buffet of fruits, cheeses and danishes. The soft music in the background and the abundance of light made it a cheerful and relaxing place to start the day. For dinner I sat at the hotel’s bar, The Pulitzer, which looks like it belongs in the 1930s with wood paneling, deep couches and tables tucked in secret corners. The attentive bartender made me a pineapple old-fashioned, a signature drink, and recommended snacks to order. I was surprised by how friendly the place was; I chatted with locals and other travelers and stayed out longer than I had anticipated. The hotel is still in its early stages, and it will be interesting to see if it can keep up its allure. For now, though, it’s a bold place with character, great service, and fun and unexpected touches. Staying there exposed me to different sides of Amsterdam’s culture, history, charm and people than I would have otherwise seen.